In this Wednesday, May 16, 2018, photo, the JC Penney logo is seen hanging outside a Manhattan mall. J.C. Penney Co Inc warned it could post a loss for the year after sales at established stores increased at a much slower pace than Wall Street had expected, as unusually cool weather in April hit demand for spring clothing. Shares of the department store chain fell 10 per cent in premarket trading after the company said it was forced to offer deep discounts to clear slow-moving inventory because of an uncharacteristically long winter. The Plano, Texas-based retailer, like many peers, is already struggling to draw shoppers who are increasingly defecting to online retailers and off-price stores. 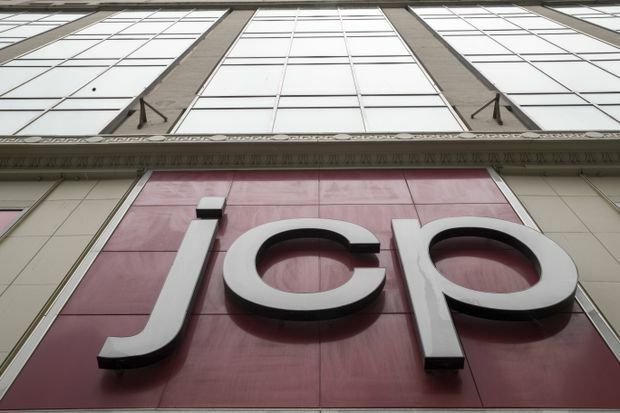 J.C. Penney said it could report a loss of up to 7 cents per share this fiscal year. At the high end of its forecast, the company expects profit of 13 cents per share. J.C. Penney had previously expected adjusted profit of between 5 cents and 25 cents per share. In contrast, Macy’s Inc raised its annual profit forecast on Wednesday thanks to strong customer spending and a greater assortment of products. J.C. Penney’s comparable-store sales rose 0.2 per cent in the first quarter ended May 5, missing analysts’ average estimate of a 2 per cent rise, according to Thomson Reuters I/B/E/S. On Tuesday, Home Depot Inc also missed expectations for comparable-store sales, blaming a slow start to the spring selling season. J.C. Penney’s first-quarter net loss narrowed to $78 million from $187 million a year earlier. Excluding one-time items, the company lost 22 cents per share, 1 cent higher than expectations. Net sales dipped 4.3 per cent to $2.58 billion and came in below the company’s own expectations. Ocado shares soar as it lands major deal with Kroger to enter the U.S.